A profile which is thicker. Ideal Tix is ​​the special high-thickness version of Ideal Wall. Its thixotropic formulation makes it perfect for decorative elements with high shock resistance (similar to concrete) and thicknesses up to 6-7 cm. Artificial rocks, surfaces in contact with swimming pool water, fireplaces, arches and stairs, door jambs, window sills … with Ideal Tix you can create all of these things, combining practicality and convenience with great aesthetic effect. 1 - Can artificial rocks be created close to water, swimming pools or sea water? 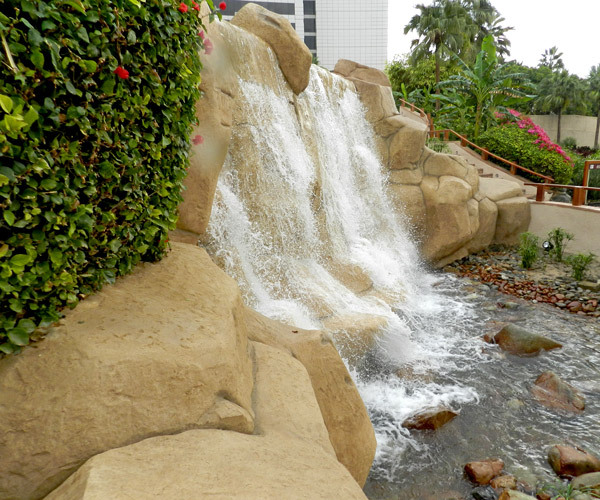 Absolutely, yes, the Ideal Tix plaster, which enables artificial rocks to be created, lends itself to the creation of surfaces in contact with water such as waterfalls or fountains. In these cases, it is wise to choose the most appropriate protective treatment. 2 - What shapes can be created and up to what size? Shapes and sizes can vary. In fact there are no limits to the size or the creative freedom of the installers. Ideal Tix plaster is easily workable and can be freely moulded. 3 - Are the artificial rocks resistant to knocks? Ideal Tix plaster achieves resistance comparable with concrete. The rocks created are therefore extremely resistant to abuse and are long-lasting. 4 - How thick does the plaster have to be? The thickness of the plaster varies from 3 cm to 8 cm, based on the specifications of the substrate and the load the surfaces must sustain. 5 - How heavy can a rock be? The weight of the material is arounda 22 Kg/m² for 1 cm of thickness. Based on thickness between 3 and 8 cm, the weight will increase proportionally. To make an overall assessment of the weight of a rock, the weight of the base structure must be taken into consideration. This may be made from various types of materials, such as: polystyrene, wood, cardboard, concrete, metal etc… Other considerations include the preparation materials: rendering in cement, adhesives for coats, metal or plastic nets. 6 - Can artificial rocks be created on any type of surfaces, exterior coats or cardboard? 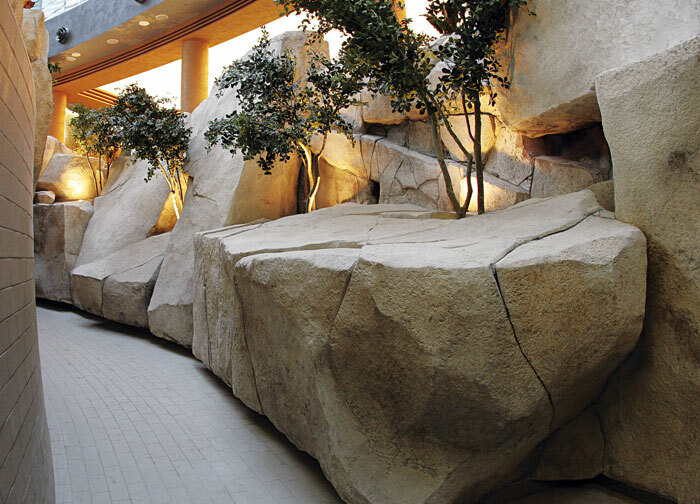 After a careful assessment of the substrate and adequate preparation, artificial rock can be installed on any type of surface. It will in any event be the task of your Ideal Work installer to make recommendations on the feasibility or otherwise of the operation and help you during the choice of the most suitable solution for your requirements. 7 - Can personalised textures be created? Absolutely, yes. Most of the rocks are created exclusively with texture prints; special processing is carried out by artists who sculpt freehand to create real works of art. 8 - What colours are available? 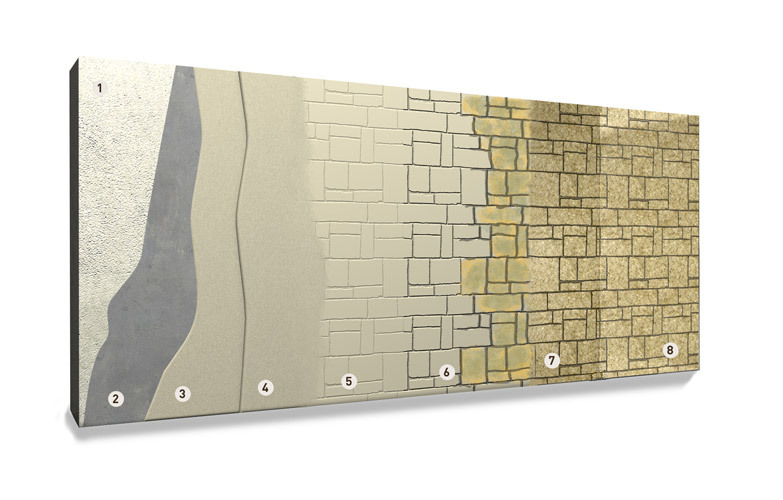 The colouring of the artificial rocks can be done by integrally colouring the plaster with the dyes of the Color pack-c (available in 24 colours) and then surface shading with the Rainbow dyes (available in 11 colours). Indeed, it is possible to mix several colours together, diluting them with water, or to modify the chromatic effects by changing the application technique. As with concrete surfaces, artificial rocks can also be acid stained with Ideal Stain acid dyes. 9 - Do artificial rocks require special maintenance? 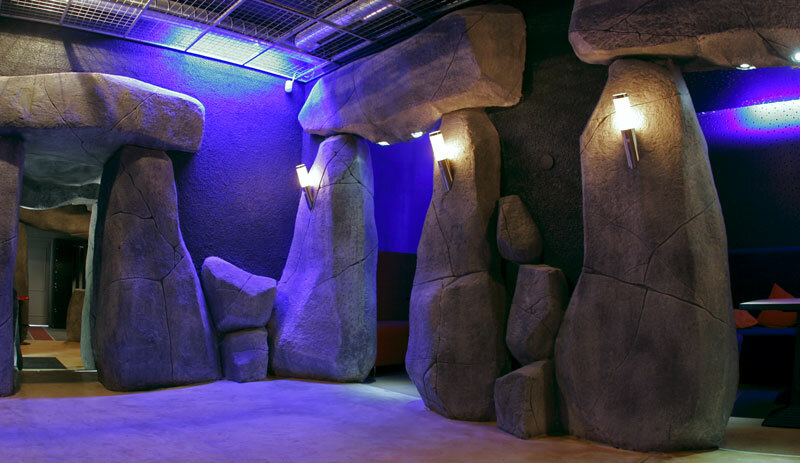 As with the printed wall, artificial rocks do not require special maintenance although they musty be sealed. It is recommended to wash the surfaces with cold water and sweep with a soft brush. Based on the climatic conditions (for example, proximity to the sea or very cold areas), it is recommended to apply a new coat of protective resin over the years. 10 - How long does it take to make artificial rocks? As the construction of rocks is a very individual process, determined by the size and shapes of the rocks being created, it is difficult to give exact timings. Safe to say, the construction of the support in wood or polystyrene usually requires longer than the actual application of Ideal Tix plaster. Once IDEAL WALL has been applied and the plaster has reached the required workability, the specific “texture” is created by means of special rubber moulds; Depending on the type of mould, the texture may be only superficial. On the other hand, the contours of stones or bricks can be made with other Ideal Work® tools. There are also some moulds that create both the texture and contours of stone, so that it is only necessary to do the finish the next day. Within 8-18 hours, depending on the temperature, you can finish the carvings or create new ones with the help of the Ideal Work® professional tools. After completing the finish, or within 1-2 days, continue with the staining process using RAINBOW COLOURS, professional Ideal Work® dyes. The product can be applied directly onto brick, concrete or stone surfaces and, after proper substrate preparation, onto other bases such as plasterboard, polystyrene, wood and metal supports. The product can be mixed directly in a concrete mixer. The special formula permits a greater workability that makes applying plaster easy and fast, even for the less experienced. A. Ideal Wall-Eco may be applied directly on concrete surfaces, bricks, rocks and other surfaces such as plasterboard, polystyrene, wood and metallic surfaces. 1. Mixing of Ideal Wall eco with water. 2. Application of Ideal Wall eco in thicknesses from 1 to 3 cm. 3. Once the mixture is laid and dry, application of Liquid release agent and stamp the surface by using moulds and Ideal Work professional equipment. 4. The next day proceed with the cleaning and finishing of the texture by using professional tools. 5. Colouring with Colour rainbow. 6. Application of protective sealer Ideal Sealer Medium (for exterior applications) or resin Ideal Acrylic (for interior applications).